Modular Home Financing – What are My Options? 23 Aug Modular Home Financing – What are My Options? There are a lot of things to think about when considering building or buying a new modular home. Probably the most pressing question on everyone’s mind is “how do I pay for this”? Modular home financing will differ from one person to the next. It is important to be informed of your options. So what are they? Most homeowners pay for their modular homes in one of three ways. The most common way for people to finance their primary residence is by far the traditional loan (“traditional” meaning a conventional construction loan. Read more about construction loans here). Banks are typically happy to lend money for primary residences because people are highly motivated to keep current on payments in order to preserve the equity they have in their home by avoiding an eviction. People who own their own homes are also more likely to take care of the residence, and typically want to stay in their home medium to long term. 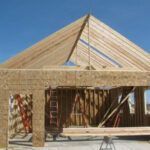 Getting a traditional mortgage to build your new prefabricated home will require gathering a lot of paperwork. This can seem like a lot of headaches (ok, it is a lot of headaches), but given today’s historically low-interest rates and the plethora of different loan products available, it can prove to be well worth the effort. Typically, the bank will want to gather these items from you for modular home financing. A “personal financial statement” – this is a document in which you list all your income, assets, current loans (including car loans) and other monthly payments and liabilities. It gives the bank a quick overview of your financial health. 2 – 3 years worth of tax returns – this will give the bank a good idea of your historic financial health and will help them determine how much of a loan you can afford. A credit report – they won’t get this from you directly, but you will have to agree to let them run your credit score in order to qualify for a loan. Other documentation/references – depending on the bank and on your personal situation they may ask for other personal or work references, verification of non-work-related income such as child support or SSI payments, or any number of additional items. Suffice to say you should be prepared to do a lot of digging in order to procure all the documentation they’ll be asking for! Not many people know this, but there are people out there who specialize in making loans to people who may not be able to get traditional modular home financing. Who are these people? They are independently wealthy individuals who have a lot of spare cash lying around and who don’t want to put it in a bank to make 1-3% interest in some savings account. There are also companies who gather large sums of money from a diverse pool of private individuals and use it to finance homeowners. The down-side of financing your new home with a non-traditional loan is that the interest rate is very high, typically ranging from 6 – 15% or more. These lenders will also usually require a lot more money down on the deal than a bank would. With a traditional loan, you will have to put 5 – 20% of your own money into the deal, but a private lender is likely to require 20 – 30% or more in many cases. So why would anyone get a loan like this, with a large down payment and high-interest rate? To put it bluntly, “sometimes ya gotta do what ya gotta do,” as they say. If you have compromised credit due to prior unpaid credit cards or home loans, most banks will not finance you without a strong co-signer. If you don’t have anyone to co-sign on the loan with you, you may just be out of luck. This is where a private investor can come in handy. The upside to going with a private investor is that you can get into your new home now. Then, hopefully, down the road, you’ll be able to convert that private loan into a traditional mortgage. This will save you a LOT of money on interest. 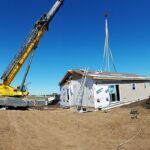 If you can swing it, the all-around best way to finance your new prefab home purchase is by paying cash. Paying cash eliminates closing costs, mortgage interest, appraisal fees, and a HUGE pile of paperwork. When you get a mortgage the bank is going to make sure to do their due diligence on you before handing over large chunks of cash, and you can be certain that they are very thorough! The bank or lending institution you seek to work with will require some documentation. There may be other items depending on the bank. Once they get ALL this information from you, there is still no absolute guarantee that they’ll finance the home for you until the day you actually close on the loan. Eliminate red tape and headache, pay cash. While there are undoubtedly other ways to finance your new home purchase, these are the most common. Now that you’re armed with the proper knowledge, what are you waiting for? Let’s get started today! At Next Modular, we know that choosing a home is one of the most important decisions you will make. As an experienced modular home builder, we are committed to being your guiding light through this process.